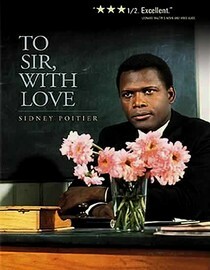 Anybody that knows anything knows that Sidney Poitier is one of the greatest actors of all time. I've never seen a movie that he starred in that I didn't love. I'm more than happy to report that To Sir, with Love is no exception. Remember during the 90's when every other movie released was a story about a teacher in the 'hood getting through to students everyone else had already given up on? Well that's pretty much the plot of this movie as well. Except it's set in London, and it stars Sidney Poitier. Those two factors make it feel completely different than every other wrong-side-of-the-tracks high school drama and that's a good thing. Watching Mr. Poitier whip these young kids into shape was a truly enjoyable experience. The teen actors provided a wonderful supporting cast. I was really impressed with the way they handled their roles, they were a perfect compliment. This is a story you've seen a million times, but it's the execution that makes it a worthy watch. Check this classic out, you won't be disappointed. According to instantwatcher.com this movie will stream until 3/1/11. Why is it in your queue? Sidney Poitier. Most memorable moment? Seeing Sidney Poitier dance at the end. That felt a little awkward but awesome. What mood should I be in to watch this movie? Looking for a good drama with enough light moments to keep you happy. Good review. My thoughts exactly. You have seen this movie before, but you haven't seen Sidney Poiter do this movie. When he breaks down at the end, I am almost did too. Yea, that was a great way to end it.